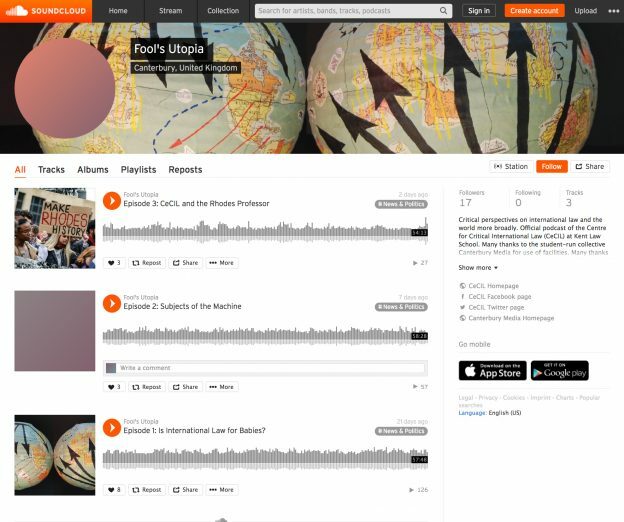 Kent Law School PhD scholars Ahmed Memon and Eric Loefflad have launched a critical international law podcast on Soundcloud called Fool’s Utopia. Fool’s Utopia, now the official podcast for the Law School’s Centre for Critical International Law (CeCIL), aims to offer more nuanced, layered and multi-dimensional perspectives on international law. After sharing their idea with CeCIL Director Dr Luis Eslava, Ahmed and Eric were encouraged to approach CSR FM (Canterbury’s student radio). As well as giving them studio space to record their weekly podcasts in the Student Media Centre on Kent’s Canterbury campus, CSR FM air the episodes every Monday at 10pm. The third episode of the podcast, CeCIL and the Rhodes Professor, features an interview with Professor Richard Drayton, who delivered the CeCIL Annual Lecture at Kent in November. Ahmed and Eric plan to interview more invited guests throughout the coming year. This entry was posted in Campus online, Student Guide on 7 December 2018 by Sophia Cheraitia.